Perhaps your Grandmother, like mine upon seeing my striped shirt, advised that “blue and green shouldn’t be seen, without a colour in between”. Fashion though, like the economy and its politics, is never constant – they are always reinventing themselves. Those clashing stripes have ‘gone out’ again but I think blue-green is set to become fashionable in the economies and politics of Aotearoa. Conservation is portrayed in opposition to economic growth, and even freedoms and fairness that are central to our aspirations as communities  – especially our small communities whose economies were based on logging and mining forests. Increasingly, however, the protected landscape and its forests, lakes, rivers and wetlands are described by the services they provide to the same communities. In the provinces of New Zealand, conservation is finding itself on the agenda of the political right – blue and green without a colour in between. Honorable Bill English (centre) speaks at the signing of an agreement between Hump Ridge Track Ltd. and Victoria University. This month a team from Victoria University visited Tuatapere, Southland, and the Hump Ridge Track Ltd. Victoria is lending its expertise in the likes of tourism, restoration ecology, business, and wildlife management to a community making enormous strides in the new blue-green economy. Honourable Bill English, MP Clutha-Southland, and Mayor Frana Cardno, Southland District, oversaw the signature of an agreement between the two partners. 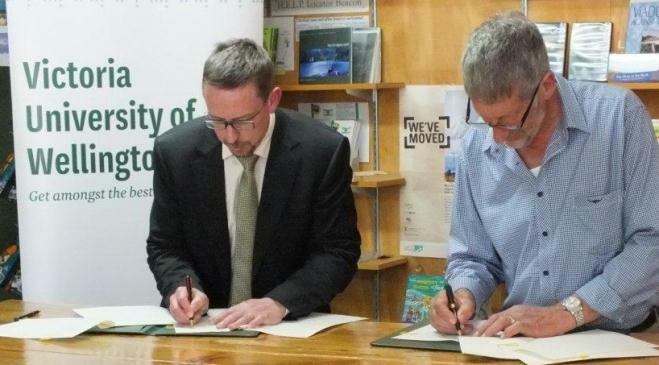 Neil Quigley (left, Victoria) and Stewart Weir (Chairman of Tuatapere Hump Track Ltd.) sign the agreement. The Hump Ridge Track story is a lesson in the resilience of our nation’s provinces and their capacity to innovate. It is one of many examples of small communities fighting for survival in new economies that are dictated by big-city voters and big-city politicians. Declining support for indigenous forestry eventually ended logging in Waitutu Forests – NZ’s largest intact lowland beech-podocarp forest – during the 1990s. 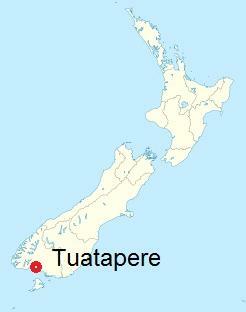 Tuatapere’s economy, based largely on exporting logs, was ‘gutted’. Later, so the story goes, Helen Clark, Prime Minister of a Labour-led government with environmental sympathies and visiting Invercargill, offered Mayor Cardno a ride to Tuatapere. Never letting a chance go by, Mayor Cardno accepted and is said to have ‘bent’ Helen’s ear for the entire 90 minute journey. Southland’s feisty Mayor must have been convincing. Two months later $900,000 arrives from the Clark government to establish the Hump Ridge Track – tourist infrastructure for Tuatapere. And so its transformation to the new blue-green economy began. The forests of Waitutu are protected and will be improved as Tuatapere grows a tourism economy. In March this year the Hump Ridge Track won tourism gold – a Enviro Gold award (Qualmark) and milestone in Tuatapere’s new economy. Our economy is increasingly based on the future of our environment – our clean water, wild places, and wildlife. Even Southland’s economy is 10-12% tourism and that portion is growing rapidly. In the long-suffering provinces of New Zealand ecological restoration and economic development are becoming partners. Think instead, Ecological Development and Economic Restoration. There is gold in them thar hills – tourist gold, Enviro Gold – hard won, but winnable nonetheless. None of this should be new to Honourable Bill English or the National-led government. The promise is that ecological restoration will be seen as a tool in the development of New Zealand’s small-town economies in districts that are often, ironically, largely National Party constituencies. These are their people doing conservation. Political commentators have identified the challenge to the National Party of finding credible coalition partners for the future. The demise of the far-right has laid National’s flank bare – undefended. But a National Party intent on seeing ecological restoration as part of its toolkit for economic development in its heartland might also steal Labour’s green stripes and attract a stronger environmental vote throughout New Zealand. The Green Party would necessarily follow. First, however, National will need to allow its belief that New Zealand’s environment is in good shape to be challenged by the over-whelming scientific evidence to the contrary. Currently National seem hell-bent on self-delusion – ignoring ecological science, dismissing scientists, and defending a brand (100% Pure), rather than protecting the environment that makes the brand possible. Perhaps a new generation of leaders in National is required – I hope not. We need to make progress much faster than that. Once upon a time, the political colour in between blue and green was red – Labour red. Increasingly, National has an opportunity to partner the environmental Green. My grandmother might also have observed that if you want to turn deepest blue, bright-bright green, just add gold. How right she was – tourism gold. 1 Fischer, D. Fairness and Freedom: A History of Two Open Societies: New Zealand and the United States. (Oxford University Press, 2012).